Well it certainly is beautiful here albeit cold! It was sub-0 this morning and with a fire in the stove the Parlor is a great place to relax from the holidays, reflect upon our lives and our hopes for 2018. We wish you and all your dear ones a happy, safe and healthy New Year! Well, we weren’t quick enough to get the camera out but we did see two male bluebirds at the birdfeeder and that’s a first for December! Our neighbors told us they had them at their feeder when we were talking at the Rural Christmas Party but we’d never seen them in the winter. They usually are seen all around here in March or April as they’re looking for places to nest. What a treat to see them! Well, now we know and we agree! Spring brings the gorgeous lilacs and we have them in abundance in Rural and around the inn. I picked a bouquet for this morning’s breakfast table – the fragrance is not as strong as usual. 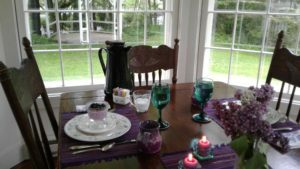 It was fun to have everything lilac color – even the blueberry yogurt! Lil’ Rev is a world-class entertainer and will help us celebrate Crystal River Inn’s 30th anniversary with his love of music and his audience! We’ll have refreshments with anniversary cake! This event kicks off a series of celebrations throughout the year – stay tuned! Lil’ Rev is a steward of vintage song and lore. Performing with ukulele, harmonica, mandolin, guitar and banjo, Rev has an unmatched repertoire of both traditional and original song, poetry, storytelling and humor. Audiences will sing-along, clap, laugh, and maybe even shed a tear at a Lil’ Rev performance. Both entertainer and educator, Rev is renowned as one of the preeminent ukulele instructors and performers in the nation with seven instructional books to his credit. Lil’ Rev performs at theaters, performing arts centers, festivals, music camps, schools, libraries, and house concerts across the nation. He’s delighted us and our guests for 9 years! If it’s nice outside we’ll sit outside by the river and gazebo – bring your lawn chairs. Otherwise we’ll be indoors. Suggested $10 donation. All proceeds go to Lil’Rev. Please join us – you’ll be glad you did! 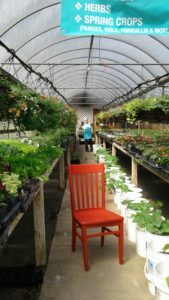 The Red Chair made it to Turners’ Farm Market Open House! We get our local, fresh vegetables here all spring and summer – ones that we don’t grow ourselves that is. 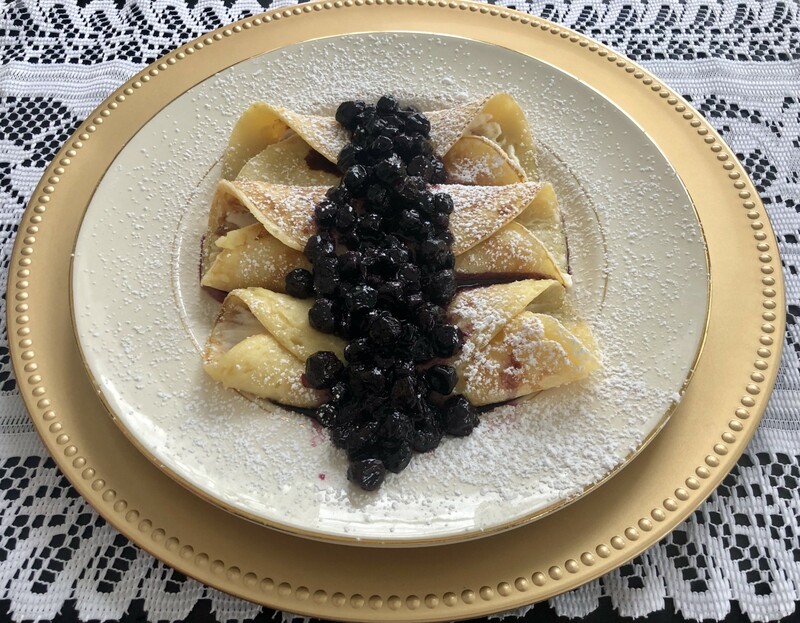 Our guests enjoy visiting and shopping here also because it’s close, beautifully decorated and have superb produce grown right near the market – no shipping! Happy Cinco de Mayo! To celebrate we’ve got a special taste treat called Fiesta Frittata. I know I wrote about it on our blog last year but that was before it won a prize at the Waupaca County Fair. Elisha made our frittata recipe, spiffed it up by putting it on a colorful plate and won grand champion! We’re so grateful to have excellent help from the Riley girls. Before arriving at the inn to help with breakfast they milk their 40 goats and probably have other chores. They’re are active in 4-H and FFA and we’re so proud of them. 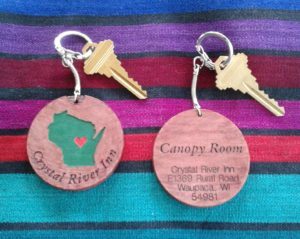 We just got some new locally made room key fobs from Simply Scandi a new shop in King. We love the beautiful craftsmanship Stacy puts into her work. Now each guest room has a reminder that we’re in the heart of our beloved Wisconsin. If someone accidentally takes a key home the address is conveniently located right on the back so it can be sent home! Simply Scandi is a beautiful little store full of Scandinavian goods – great for your home or for gifts. I’ve taken my mother and she was delighted to find just the right gifts from Norway to send her sister. We had to go shopping so we decided to take “Red” the traveling chair along for the ride. First stop is the Riley Crest Organic Farm. Kari suggested we take Red to see the kids. They’re so curious and immediately came to investigate and then nibble. Well, if I were Red I may have been tickled by the kids! As it was my shirt was dangerously close to being lunch! Riley’s goat herd grew by over 40 this spring with new kids joining the family. What fun! 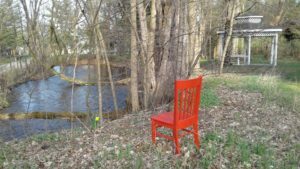 Well, you may have heard about the traveling “Red Chair” – think of it as a chance to see many B&B’s! 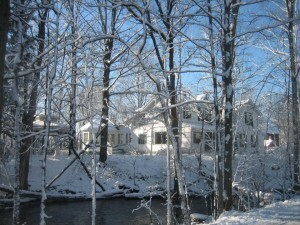 We had it here last weekend and here’s the first picture of it in front of the Crystal River – only one daffodil out then and now we have MANY daffies blooming!